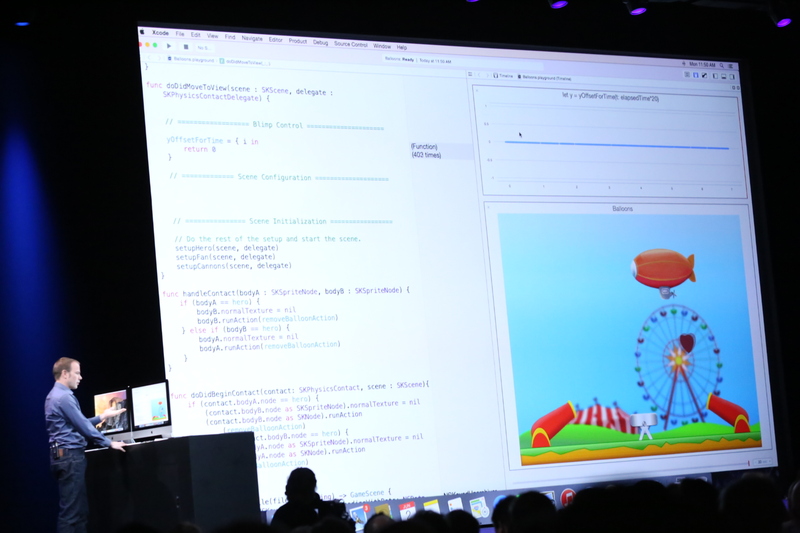 At its WWDC developer event today, Apple surprised all of the developers in the audience by launching a new programming language called Swift. This new language seems to be poised to replace Objective-C as the main programming language on Apple’s platforms. Swift will use the same LLVM compiler and runtime as Apple’s Objective-C implementation, so Swift and Objective-C code can live side-by-side in the same application. The language provides access to all of the Cocoa and Cocoa Touch features developers are currently used to from Objective-C. It should feel familiar to those who are already used to Objective-C, Apple says, and is meant to “unify the procedural and object-oriented portions of the language.” It does diverge from Objective-C in more than just the syntax, though; it also features variable types like tuples and optional types. It also includes operators that aren’t found in Objective-C, which allow you to perform remainder operations on floating-point numbers, for example. In addition, Apple notes how the language was designed for safety, with variables that have to be initialized before use, arrays and integers that are checked for overflow and automatic memory management. Swift support, of course, will be deeply integrated into Apple’s updated Xcode IDE. It will feature an interactive “Playground” that allows you to edit your code and watch how your changes influence your app in real-time. Xcode’s debugging console now also supports Swift syntax natively. 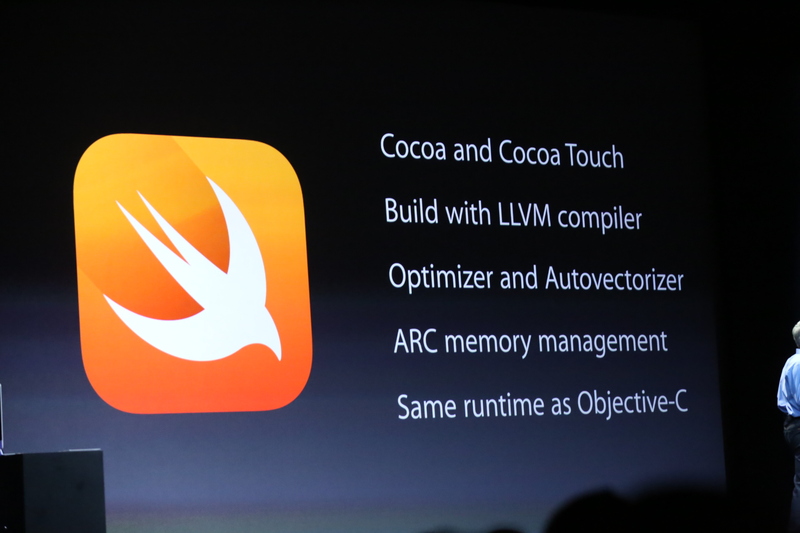 According to Apple, Swift will provide a number of significant speed advantages to developers. A complex object sort, for example, will run 3.9x faster than an implementation of the same algorithm in Python. 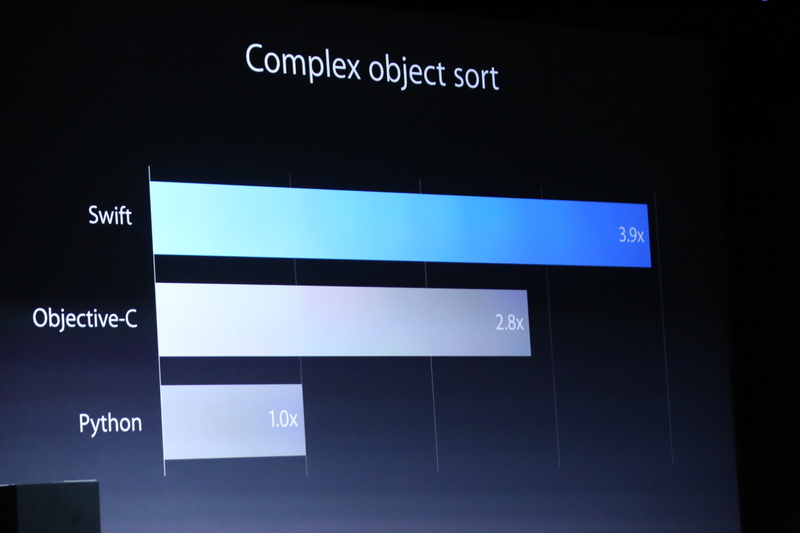 That’s also faster than Objective-C, which is 2.8x faster than the Python version. We will obviously need to take a closer look at this new programming language and how it relates to other languages. Apple is making the documentation available today, both as an iBook and on its developer site. Objective-C was always a hard language to pick up for new developers. We will also have to see if Swift makes getting started with app development on Apple’s platforms easier, but from a first look at the documentation, it definitely feels more accessible than Objective-C.